Discussion in 'News - Breaking News & Political Forum' started by Mooney72, Jan 25, 2019. BINGHAMTON, N.Y.—On January 22, parents and community members from Binghamton, N.Y. held the floor for two hours at a school board meeting, presenting their demands in the wake of an incident where administrators at East Middle School strip searched four 12-year-old Black girls without the presence, consent, or even notification of their parents. The story that emerged at the meeting is a thing of unrivaled ugliness. On January 15 (Dr. King’s birthday, as more than one speaker pointed out), during lunch period, Principal Tim Simonds noticed four girls engaged in behavior he qualified as “hyper and giddy.” On that basis, he had Assistant Principal Michelle Raleigh and the school nurse search the students for drugs. Three students were made to remove their shirts and were searched in only their bras. One of those students was also made to pull down her leggings, exposing her underwear. A fourth student refused to remove her clothing and received an in-school suspension as a result. During the searches, the nurse made humiliating comments about one girl’s skin and another’s breasts. Parents were not notified—at least, not until their daughters told them after school that they had been held, questioned, and searched for over an hour. The mother of one of the girls described how she had requested an incident report on the search, but instead received a letter dated the next day, claiming that her daughter had consented voluntarily. No drugs were found in the search, though that fact is irrelevant to the degrading treatment inflicted on the girls, as community members pointed out. Progressive Leaders of Tomorrow (PLOT), a grassroots racial justice organization in Binghamton, formulated demands based on their discussions with the girls and their families. Those demands include an end to strip searches of children for any reason, the removal of the school leaders and staff involved, a public apology to students, parents, and the community, and alternate instruction for the students until the situation is resolved to their families’ satisfaction. Other organizations adopted those demands as well, including the Broome-Tioga NAACP and TruthPharm, which advocates for humane, equitable, and research-based drug policy. 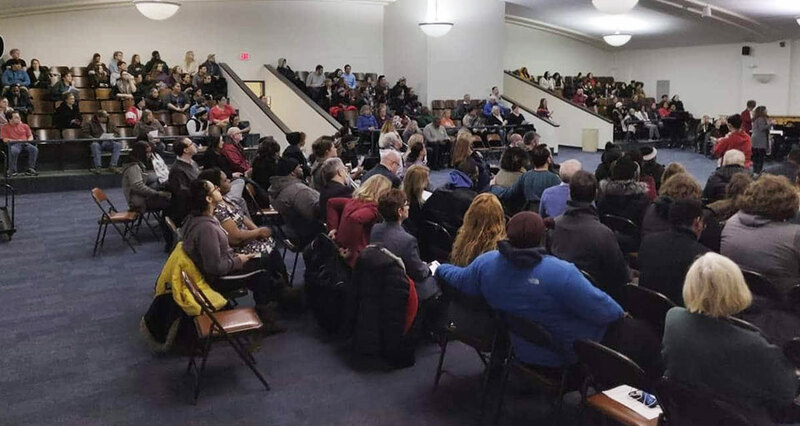 Community members insisted on the board’s obligation to listen—not just to their grievances and demands, but to a sophisticated, collective analysis that placed the incident at East Middle School in its broader context of white supremacy, violence against women and girls, the War on Drugs, and the need for democracy and accountability. 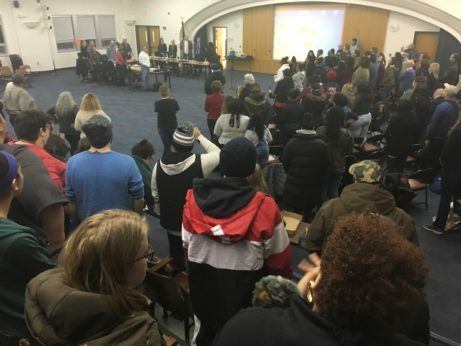 Parents and community activists spoke to the ongoing struggle against racially discriminatory discipline in the Binghamton City School District. Current and former students expressed their solidarity and shared their own stories of discriminatory treatment, sexual harassment, and sexual assault in the district. Medical professionals and policy experts pointed out that trauma like this puts children at a higher risk of adverse health outcomes—including substance abuse. Educators, parents, and voters questioned the competence and judgment of the school administration and reminded the board that they are elected officials, serving at the behest of the people. The East Middle School community made itself heard, but the district’s response suggests that its priority is to avoid accountability. A follow-up rally is scheduled at East Middle School on Tuesday, January 29, at 3:15 PM. — write to BCSD Superintendent Tonia Thompson ([email protected]), telling her implement the community’s demands; and — contribute to a fund established to support the girls in their healing and recovery from trauma. Parents, students, educators, and the broader community are keeping up the fight to hold school officials accountable, end the barbaric practice of strip searching children, and build schools where the happiness of Black girls, and all kids, is welcomed and cultivated, not criminalized and punished. nysister, prettyinpurple, itsallaboutattitude and 1 other person like this. thefineprint, Sanity, kblc06 and 16 others like this. thefineprint, IslandMummy, janaq2003 and 8 others like this. Perverts! How dare they undermine the trauma of the girls. Sanity, Brownie, janaq2003 and 6 others like this. This is what a bail money fund is for cause ain't no way. I am shaking at the thought of one of my girls being strip searched with or without me being present. All that and they still came up short on evidence??? Even if I worked in the office I would have probably thrown myself in front of them like a human shield. I don't understand. mensa, IslandMummy, prettyinpurple and 4 others like this. mensa, NJ11, IslandMummy and 7 others like this. If I had children, I would tell them to tell the school to call my mom then have a seat. We really have to (a) prepare our children on how to deal with this mess ahead of time and (b) let them and the schools know this is not going to happen with my kid! Sanity, mensa, Brownie and 12 others like this. I signed a petition today about this. Then to see MAGA's attack Jussie Smollett. Someone sent that to me directly. I try to be selective in my intake of information. prettyinpurple and Atthatday like this. Binghamton used to be a Klan hotspot. No surprise they'd pick on Black girls. Who is the principal and who is/were the nurses? We can be our own worst enemy. How can you tell when pre teen girls are 'hyper and giddy'? What the principal should have done was to call the parents if he was so concerned about drug use. My child would have my permission not to comply with any actions until I or her father get to the school. Let's just say that they don't me to come to the school because of this. The parents should sue the school, the principal, the assistant principal and that 'chatty' school nurse (why isn't her name released?). prettyinpurple, nysister and Everything Zen like this. Binghamton used to be a Plan hotspot. No surprise they'd pick on Black girls. Who is the principal and who is/were the nurses? We can be our own worst enemy. The principal and the assistant principal appear to be white. That whole area of New York State used have heavy Klan activity. The Africana Studies Center on the Cornell campus in Ithaca got burned to the ground twice when they tried to put it on the main part of the campus. Not it's this tiny little building on the out-skirts of that huge campus. nysister, MilkChocolateOne and Everything Zen like this.